The Perfect Lesson for Life! This is a parent/child TOTAL participation. This program introduces balancing, agility skills and eye-hand, eye-feet coordination skills. At this age, a child’s level of independent mobility will typically progress from aggressive crawling into running. 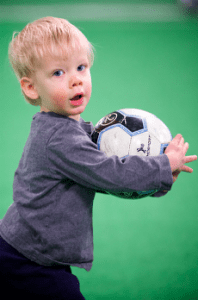 Additional fine and gross motor skills developed during this stage including kicking a ball, throwing a ball and stopping a ball. The Atmosphere is FUN & MUSIC filled!! Location: OTC, located at 5 Victoria Dr., Monroe.